Our tours allow partners of different abilities and interests to holiday together, they are interesting for leisure cyclists OR enthusiasts. Unpack just once and come home each night to a wonderful meal and a comfortable cabin with your own en-suite bathroom. 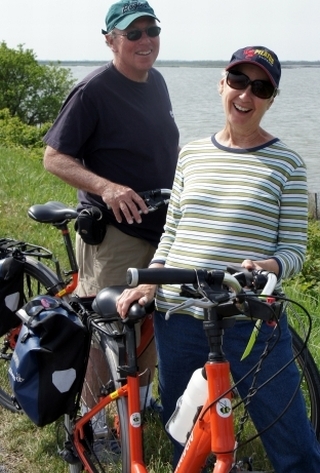 Our Reservations Manager, Sue and husband Karl joined our Bike & Barge cycling cruise along the Moselle and Saar Rivers in Germany and thoroughly enjoyed the experience. 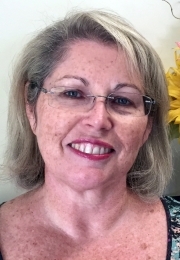 Sue is very much the expert on Bike & barge cycling cruises so to talk about your holidays plans for this year or next - call (03) 57 501 551. 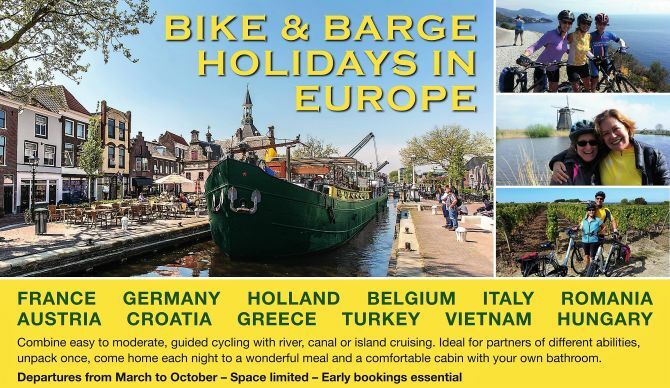 We now offer an amazing 148 different Bike & Barge routes with over 60 different barges or boats in 18 different countries mostly in Europe. 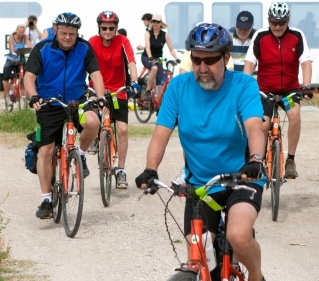 These mostly fully inclusive cycling cruises offer chance to explore beautiful countryside and historic cities sampling traditional Belgian or German beers, regional wines and fresh cheeses, hams or local produce in the company of like-minded cyclists. These holidays are conducted in English but passengers often include a mix of different nationalities with English, German, French or Dutch as the main languages - adding to the cultural enjoyment of the experience. Well-maintained multi-geared bikes are provided (passengers can bring their own if they prefer) with panniers to carry your picnic lunch and camera. The cycling is both fascinating and varied with free time to explore each days destination. 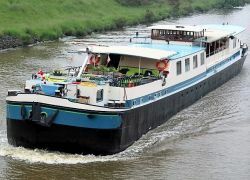 We offer different standards of barge for these cycling cruises from STANDARD to STANDARD PLUS, PREMIUM and PREMIUM PLUS. This is based on our assessment of the size and age of the boat, the size and configuration of cabins (twin or double, split level or bunk beds), comfort and availability of public areas and several other factors. Of course each barge is unique - as they are almost all converted from former cargo barges - and some have both STANDARD and PREMIUM cabins often at different levels. 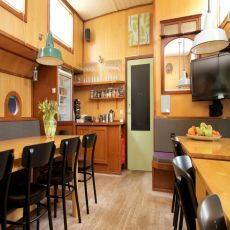 ALL our barges have clean and comfortable well-designed cabins with their own shower / toilet (not shared facilities) with towels, bed linen supplied. All have space to store / hang clothes and baggage (large suitcases are discouraged usually because there are stairways and deck areas to negotiate to get to the cabins - but they can be accommodated often under beds). All the cabins have windows or portholes, reading lights and power points (bring your own adapter). Helmets, water bottles and wet-weather clothing are generally not provided. 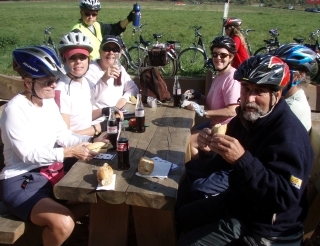 A suggested typical day will include a buffet breakfast, briefing on the route and bike check, 2-3 hours of leisurely or moderate cycling (most rides are along sealed tow-paths, back-roads or trails through river valleys or beside canals or perhaps along a rugged coastline), picnic lunch with some sightseeing, a further 2-3 hours (as the boat goes ahead to the next overnight stay) then afternoon tea, a shower or swim, a 3-course dinner followed by a city walk, canal boat sightseeing or a stroll for coffee or night-life in a historic square. Demand is high and early booking is essential - ask about next year's dates now. Our most popular two-week itinerary, from the beautiful city of Bruges in Belgium to the capital of France, Paris - the City of Light. 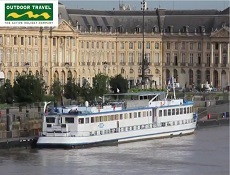 This cruise visits several historic towns and cities, Conflans, Compiegne, St. Quentin (with its Gothic basilica), through the tunnel of Riqueval, to Doornik once an important place for tapestry making and to Oudenaarde (which has a beautiful town hall) and the historic and beautiful city of Ghent. The ride from Paris or Bruges takes in quiet country roads, tow-paths, paved forest trails and the occasional cobblestone road in cities and major towns. In Belgium we cycle through relatively flat country and much of the route will be along tow-paths. In France we follow country roads and the occasional bike path. Towards Paris the terrain will get hillier and of course traffic may increase, as we get closer to the city but there is the option of staying on the boat to avoid the traffic if you prefer. 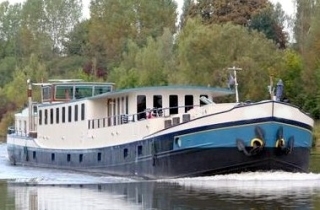 There are several boats and several routes that we offer between Bruges and Paris. A highlight of some departures on the cruise aboard our barges will be a two-night stop in Peronne, a small town in the Somme region of Northern France, just 35km from Villiers-Bretonneux where ANZAC Day is now celebrated each year. From Peronne you have access to the many important World War One Western Front battle sites, cemeteries and memorials and there is free time to visit Amiens, Fromelles and Bullecourt. 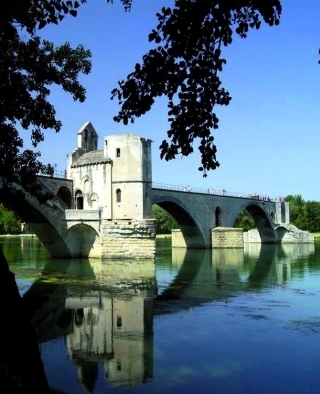 The Rhone Delta and the marshlands of the Camargue with its flamingos, bulls and wild horses, ancient churches and Roman history, painter Vincent van Gogh's Arles, the medieval village of Les Baux and wines of Chateauneuf-du-Pape. 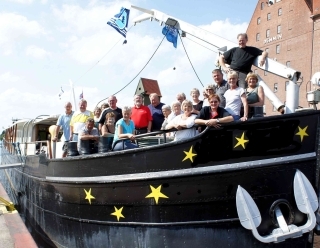 Our barges on this route are in the classic Dutch barge style converted to accommodate passengers in comfort with air-conditioned spacious saloon bar and dining areas with lots of natural light, comfortable sofas and armchairs and large picture windows. There is an outdoor sundeck with a fixed awning and tables and chairs. 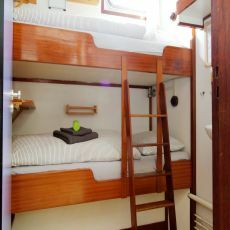 There are up to twelve comfortable air-conditioned twin cabins each with a well-equipped en-suite shower and toilet. 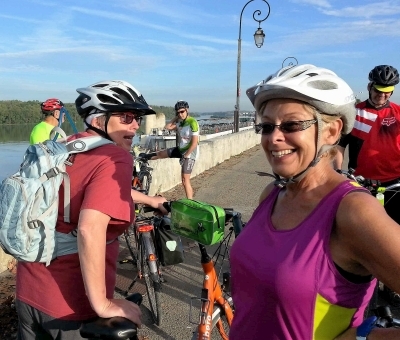 Our cycling and cruising itinerary winds its way through scenic back-roads, by the calm waters of the Camargue and along the River Rhone in the glorious South of France. Known for its wildlife flocks of pink flamingos, pelicans, cormorants and other sea-birds abound. Here we discover the traditional black bulls bred for the bullrings, the horses and Camargue cowboys, the flamenco music of the gypsies, fields of wild rice, sunflowers and salt farms. An area rich in history and art we see many reminders of the might of the Roman Empire and the inspirational landscapes that attracted many impressioniste painters including the great Vincent Van Gogh. Travel through an ever-changing rural landscape - a landscape made famous by the paintings of the Dutch Masters - as you relax with an easy cycle from country to country visiting some of the finest cities in Europe; Amsterdam, Bruges, Ghent, Antwerp. We have a very limited number of cabins available on a selection of barges of differing size and layout on this most popular and fascinating route - ideal for both enthusiastic cyclists and beginners. These fully inclusive cruises offer regional cuisine, well-designed cabins with an en-suite shower / toilet and comfortable lounge / dining areas - mostly with outside sitting areas too. 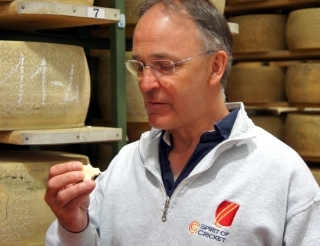 There is the chance to sample the local beers or cheeses famous in this area of Europe and to explore the towns and cities, shopping centres, squares, historic buildings, bars and cafes at each evening's port. The cycling is fascinating and varied - mostly flat - with free time to explore the highlights along the route. 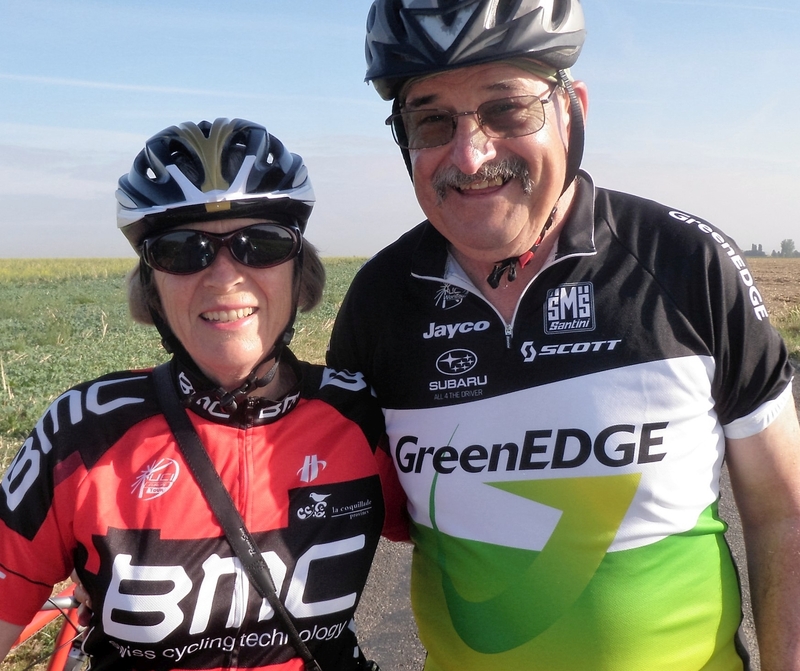 We provide experienced cycle tour guides - although you are free to cycle at your own pace if you prefer - and well-maintained multi-geared bicycles with panniers and a lock. The landscape of the River Vecht - that inspired many Dutch paintings. Kinderdijk - the UNESCO protected windmill-park that created one of the first polders. Zierikzee - a 9th Century centre of trade and prosperity rich in traditional architecture. The Delta Works - the Dutch way of taming the sea by building this enormous dam. Ghent - one of Belgium finest cities, old, yet alive, the pride of West Vlaanderen. Bruges - a living historical city with many famous museums, squares, churches and canals. 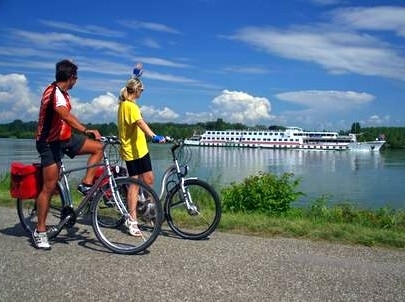 Bike and Barging, cruising and cycling along the River Danube is a highlight of any tour to Europe and this is a self-guided program for those who want to be more active and to travel at their own pace. 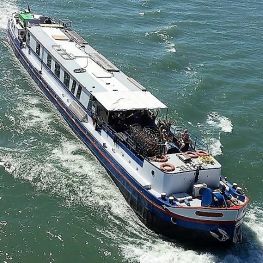 We offer cabins on a floating hotel on a route that is generally gently downhill, mostly with a helpful tailwind. Spend your days exploring the river from Bratislava, the former city of Hungarian kings, to Vienna with St. Stephens Cathedral, beautiful town hall and Riesenrad (Ferris wheel). The Naschmarkt (food market) in Vienna is a cultural and culinary adventure and there are cosy coffee shops, bars and typical Viennese wine taverns. On the mighty River Danube spacious, traditionally built cruise ships carrying up to 135-passengers with an attentive crew and a comfortable atmosphere. Regional cuisine is served to reflect the countries visited. On board there is a restaurant and bar and a sun deck with comfortable deck chairs. There are up to 87 comfortably furnished cabins, (approximately 9-10sqm) usually with twin-beds each with en suite (shower and toilet), hair-dryers, TV and air conditioning. All cruises start and end in the beautiful town of Passau (Germany). The city of Venice has been a Mecca for tourists for centuries and still today is a must see inclusion on any itinerary for Italy. 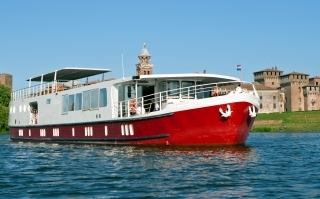 Our Bike & Barge holidays stay overnight in Venice with free time for you to explore the city. Few can explore the Venice Lagoon, as it can only be done by boat, or the Brenta Canal with its many splendid villas, market towns and colourful fishing villages along the River Po delta, places important for trade since the time of the ancient Greeks. Our cycling itinerary winds its way along the Mincio and Po, deep into untouched rural Italian countryside through land reclaimed from the marshes over many centuries. Now framed by pine-forests and polders this area is a haven for numerous birds and animals. We can discover local fish markets and sandy beach resorts, see romantic villas, ancient castles and cultural centres, taste typical cheeses, Italian cuisine and of course the wine before arriving at the beautiful city of Mantova. In low-water periods, the River Po is navigable only from the estuary to Polesella so we have an alternative route along the Fissero / Bianco canal, which runs parallel to the Po. The tour itinerary offers mostly flat terrain and the daily cycling stages are easily achieved varying from 28km to 55km. Much of the riding is along tow-paths beside rivers and canals, on sealed cycle paths or roads with a low volume of car traffic. 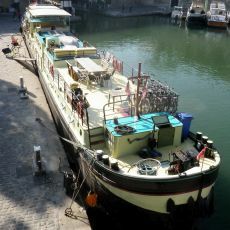 The barges will often sail during breakfast or during the evening meal to make leaving busier towns easier or to shorten the cycling stages. 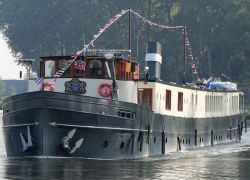 We offer two barges with 11 (PREMIUM) or 17 (PREMIUM PLUS) cabins each with twin beds and a private bathroom with an en-suite shower and toilet. 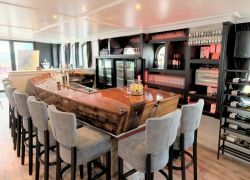 The barges also have a saloon with bar / restaurant and there is a spacious outside deck area ideal for relaxing and sightseeing. 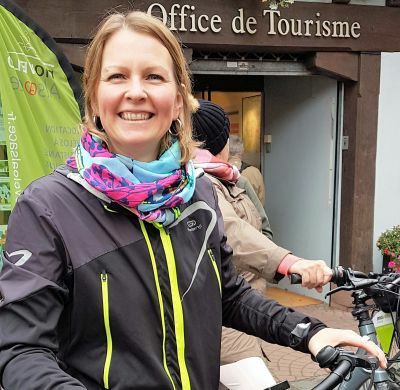 Offering an easy-to-moderate, mostly flat cycling route, this tour follows the Moselle Valley and the River Saar, mainly in Germany and bordering Luxembourg, with beautiful, diverse rural scenery and ample opportunity to sample the wines and local cuisine that makes this region famous. 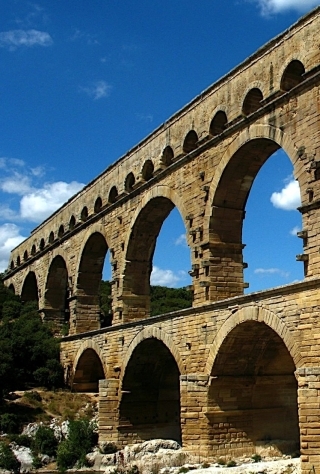 Our tour offers an insight into a rich European and also Roman history. We cycle through one of Germany's greatest wine-growing areas and discover the excellent but uncomplicated wines from the Saar and the more famous ones of the Moselle. The main ingredient is Riesling, known as the Queen of grapes. The countryside is splendid, the cool wines and local cuisine delicious, the picturesque riverside towns are rich in history and the cycling is interesting and varied. Aboard our comfortable barge the Captain and crew have a reputation for their hospitality, serving excellent meals and with a keen attention to their guests needs. 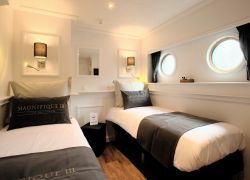 The barge has just 7 small, but well equipped cabins with twin or double lower beds, each with their own ensuite bathroom. The saloon has a comfortable reading nook and dining area and there is a lovely covered seating area up on deck which offers great views of the pretty riverside vineyards and villages. Explore this once hidden region of northern Germany, formerly East Germany or the DDR which today is a true natural paradise of rural villages, woodland and forests, wetlands full of birds and wildlife, tree-lined lakes and beaches. We travel the north and east from Berlin to the Polish border and Baltic Sea coast. 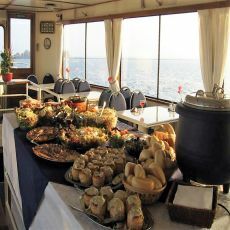 The Captain, his wife and crew have a deserved reputation for hospitality with a high standard of meals and services. They will certainly make you feel that this is your home away from home. 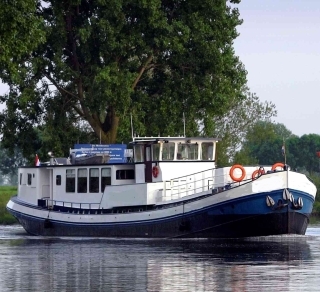 Our barge has 12-cabins, allowing for a maximum of 24 guests. 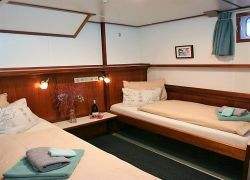 All cabins are air-conditioned and have en-suite facilities and are comfortably furnished with clean linen and towels. In the saloon, where meals are eaten, there is a fully stocked bar for wine, beer or soft drinks. Hot drinks are available at all times. Departing weekly from Paris explore this beautiful French countryside sampling the wines and local cuisine that makes this region so famous. 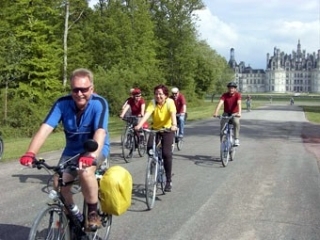 Located between the towns of Nevers and Montargis we have found a beautiful area in the Loire Valley that is ideally suited to cycling holidays. This area offers a great variety of history and culture, quiet roads and a gently rolling landscape. 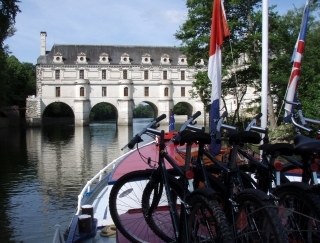 The many chateau and small villages make this cycle tour a unique experience. 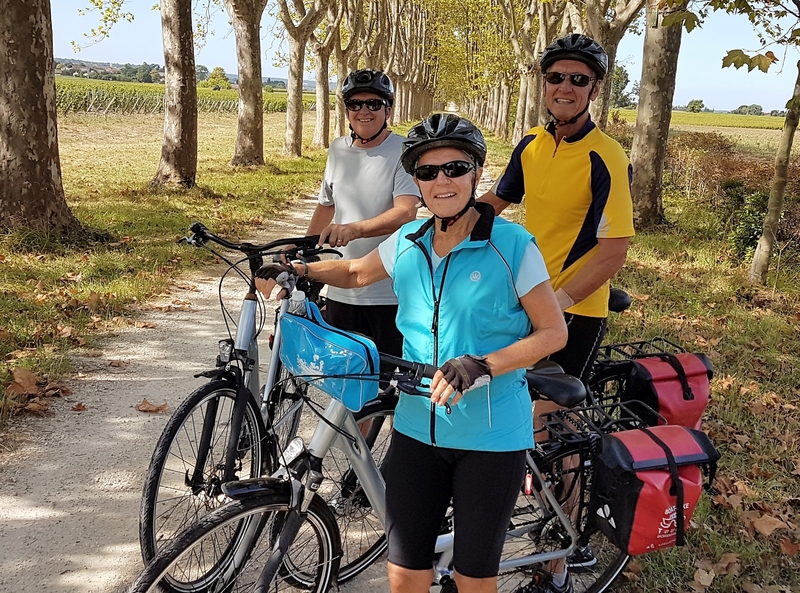 Experience the atmosphere of the old-Roman city La Charit-sur-Loire with a short walk and in the afternoon you cycle through the vineyards of the Pouilly Fume wines, visit Sancerre centre of an important wine growing area. Cycle to Beaulieu, Chatillon-sur-Loire, the Chateau of St. Brisson, the bustling market in Chatillon-Coligny and the chateaux at La Bussire. 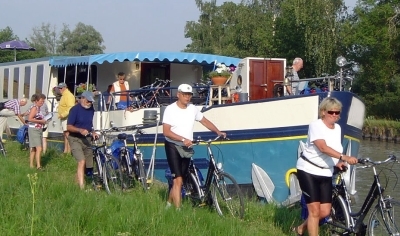 For any one who loves the unspoiled French landscape, good food and a good glass of wine, we have several boats on the Champagne route from Paris and in the Upper Loire Valley that are exactly tailored to the small French canals and locks and ideal for cycling cruises. These regions of central France are easy to access offering easy to moderate rides (some hills in Champagne) with lots of charm and history. There is much to see, there is generally a mild climate and the fine wines of the Loire and Champagne are renowned worldwide. 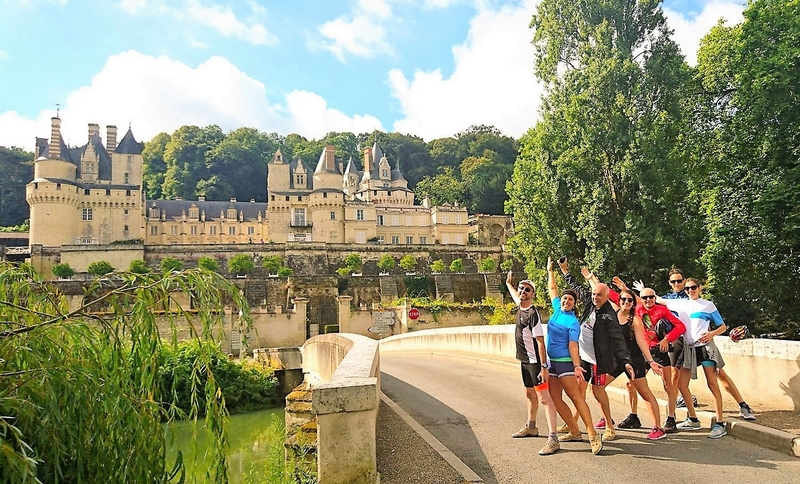 See Paris from a totally different perspective, cruising from picturesque Moret-sur-Loing to Compigne and cycling along the winding rivers Seine and Oise, we visit the chateau of Fontainebleau and Chantilly through the forests of Senart and Compigne. We see scenes that inspired Van Gogh and Sisley and many other Impressionist painters. We have a free day to explore Paris independently, you choose which sights to see, be it the Eiffel Tower, Notre Dame Cathedral or Sacre Coeur, the Champs Elysees or Bohemian Left Bank. Paris by night is floodlit and spectacular and we cruise through historic locks & swing bridges along a 19th Century canal. 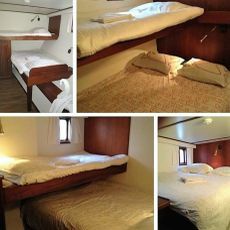 Our newly renovated barge on this route has just 9 simply furnished cabins, all with a compact en-suite shower/toilet. Most cabins have two split level beds, 3 have a double bed and one is a single bed cabin. This is the smallest and most sparsely populated region in Croatia with unique little towns and beautiful island countryside. Experience the island of Korcula with its old township and wine growing peninsula of Peljesac. Visit the island of Mljet with its impressive national park. Our tour guide will guide you through the towns of Trogir, Hvar, Stari Grad and Korcula, which are almost all protected by UNESCO world heritage listing. A more challenging ride the daily itineraries of 30 - 50km will take you through hilly, sometimes mountainous terrain with long and steep climbs but there is plenty of time to rest or walk as you choose. The cycling is mostly on sealed roads (rarely travelled outside the holiday season) and each day you can either decide to bike alone, using the information and maps provided, or join the two tour guides. There is time each day to swim or relax on board the boat. 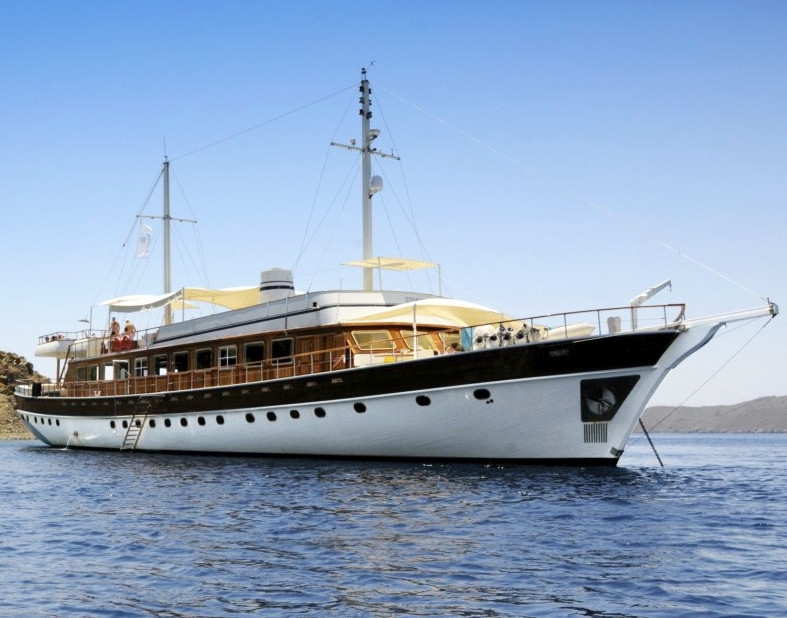 With a comfortable Turkish Gulet and by bicycle explore the sunny islands of the Greek Aegean. These islands offer a magical and mystical world, rich in history and the full of the stories of the gods. Relax in sun-drenched idyllic bays and coves, discover Asclepion, home of Hippocrates, snorkel or dive off the holy island of Patmos, discover wonderful panoramas, traditional villages and a peaceful way of life on your bicycle tour on the island of Samos. 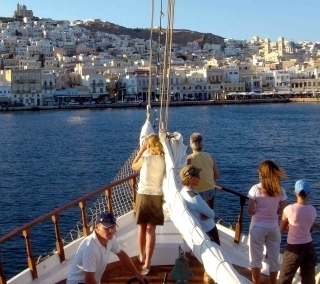 The Cyclades, comprising more than 30 islands and known as the cradle of the first European civilization some 5000-years ago, offers gleaming white cubic houses with blue shutters and labyrinth of small streets and alleyways. The mostly ragged coastline offers pristine beaches, impressive geological formations and a turquoise-blue sea. 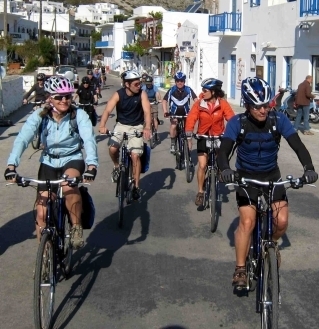 Moderate cycling routes will take you from port to pier, beach to hilltop with views of the central archipelago of the Greek Aegean that seem to go on forever. 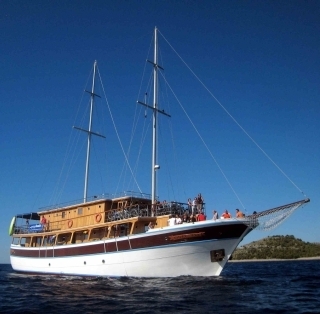 Spend a week discovering the southern coast of Turkey from Marmaris to Fethiye aboard a traditional wooden ship. 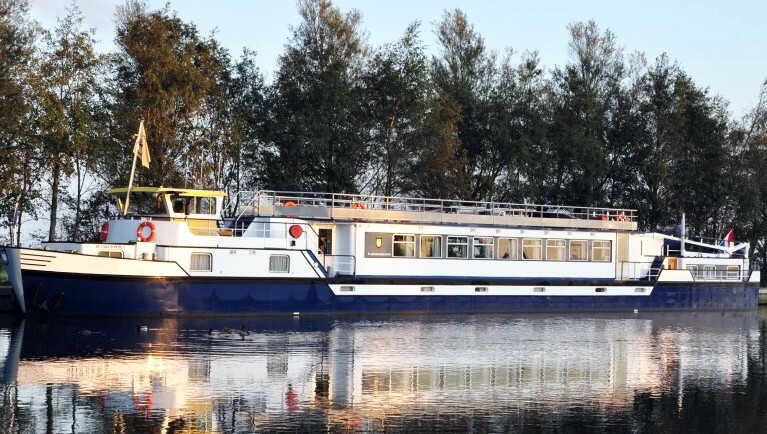 Your floating hotel is built to the highest of standards with your comfort in mind offering 8 to 12 roomy cabins each with their own heating/air-conditioning and a generously sized shower/toilet. 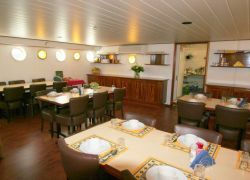 There is a spacious sun deck and a sheltered outdoor eating area. Get to know the Turkish coast and back-country between Marmaris and Fethiye with the aid of a trek or mountain bike. 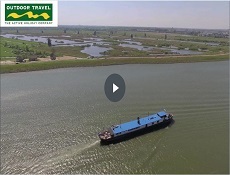 Your cycle tour guide will point out the unique natural wonders and historical cities along the route transporting you back through history. Admire the famous graves of Kaunos, cut into the cliffs two centuries ago or be mesmerized by the breathtaking Sakklikent Canyon. Spend your evenings in deserted bays and coves or make the most of the pulsating night life in the port cities with their many cafes and bars. 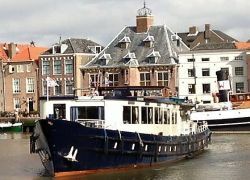 Detailed itineraries & trip notes are available for these destinations & our staff have personally experienced many of these cycling cruise tours, have inspected the boats & barges & can explain the differences between standard & premium boats. 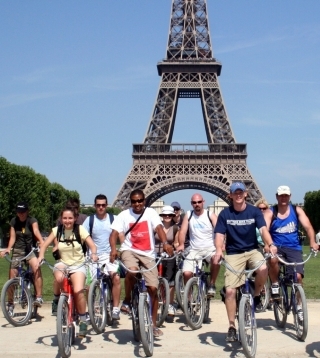 Small group or self-guided inn-to-inn cycling holidays in many areas of Europe including France, Italy, Germany, Ireland, Spain, England, Austria, Hungary, Romania, Czech Republic, Switzerland, Finland PLUS tours in Japan, China, Vietnam, South Africa, New Zealand, USA & Canada - ask for details.